Parokeets blog is celebrating it’s second birthday today! You’re the best readers out there so you deserve the best award possible! Your support, enthusiasm and comments mean the world to us, so we decided to invest a lot of time in this giveaway to give back to you at least a fraction of the joy you bring to us. Companies we contacted really came through and donated a lot of fantastic products for our giveaway. Zoya: Crystal, Edyta, Valerie, Sparkle Gloss, Armor, Anchor. Essie: Fall 2010 minis, Ejuvenate Discovery Set, Good To Go top coat, crystal file. Color Club: Worth The Risque, Wild and Willing, Catwalk Queen, Electronica, Revvvolution, With Abandon. Sweetscents: Flat Gold, Twilight, Coffee, Oriental Beige, Confederate Blue, Penny, Teal, Iridescent Copper, Goldstone, Perfection, Cornflower, Egyptian Sands, Amethyst + 30g Green Tea Overnight Rejuvenation. 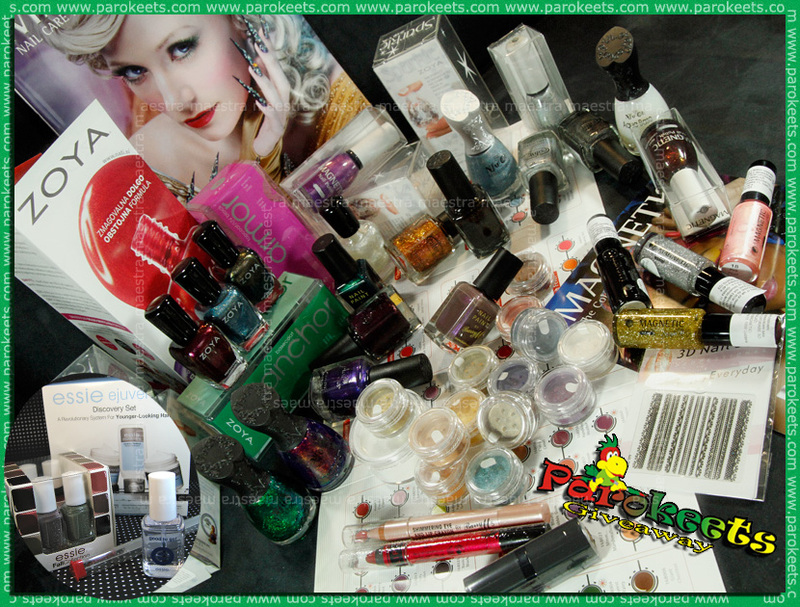 Magnetic: Shimmering Silver, Finger Fashion, Glamour Brown + Strip It: Silver Glitter, Gold Glitter, Ping Pearl, Black. Nfu-Oh: 51, 56, 65, Aqua Base. 3D Nail Seal stickers. Barry M: Dusky Mauve and Racing Green polish, Scarlet Red lip lacquer crayon, Marshmallow shimmering eye and lip crayon, Peachy Pink lipstick. P.S. And if you think this is the only prize you can win, you’re mistaken. Next week we will open a new challenge with nice prize for the winner. Giveaway is now closed. It will probably take couple of days to sort all the entries, but we’ll try to as quick as possible. Great giveaway. Thank you for the chance! Have you seen my giveaway on my blog? This is my first giveaway, and I’m celebrating 25+ followers! http://t.co/3Jv6WOM Feel free to have a look! If you filled out the form in the post you’re already entered. Good luck. if this is a contest why would there be applied customs to a international winner, wouldn’t it be sent as a gift or something like that since it wasn’t purchased. Just entered this wonderful giveaway. Hope my entry went through…..the page went blank when I hit submit. I just entered! Lovely giveaway! Wow …what a prize :)) great giveaway!! oh in ah, ko bi le imela srečo! Great giveaway! I just entered! Happy Birthday! Congrats on 2 years. And thanks for this great giveaway!!! That’s so nice! Happy birthday to your blog!!! Omg! What an awesome giveaway! …pa seveda manikur, pa MU-jev pa tudi zvestih bralcev. Happy birthday to you and many thanks again !!! Ladies, what a great price! I follow you with GFC (Linda Canter). 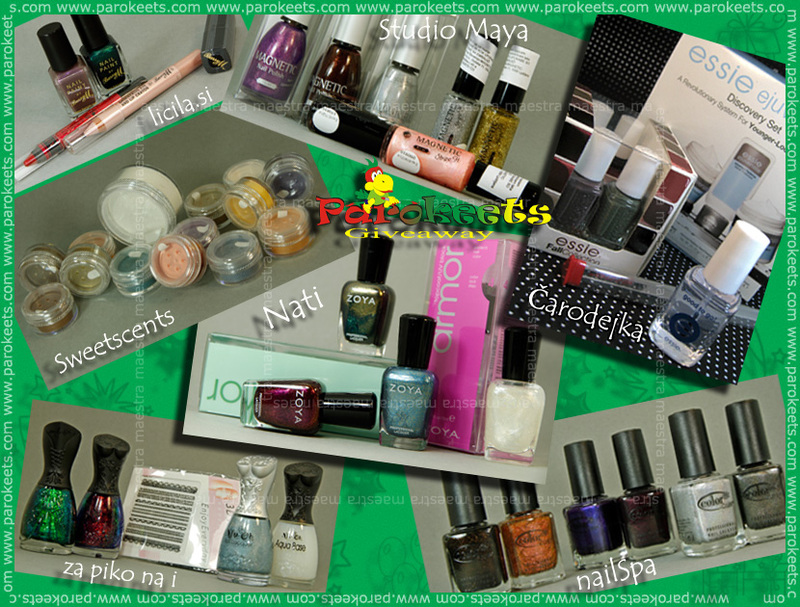 I blogged about the giveaway on my beautyblog and I follow you via Facebook ánd Twitter and I have Twittered it also. wow this is so much!